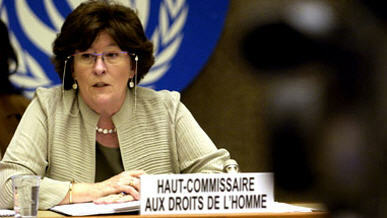 The United Nations High Commissioner for Human Rights, Louise Arbour will make a five-day working visit to the DR of Congo on May 13 2007. During her visit, Ms. Arbour will meet with President Kabila and other political authorities. The main objective of this visit is to encourage the new institutions in the country to combine their efforts with that of the United Nations to improve human rights in the DRC mainly in the fight against impunity and in building up solid structures for the protection of fundamental liberties. In Kinshasa, the UN High Commissioner will meet, other than President Kabila, the Prime Minister, Antoine Gizenga, the National Assembly’s president, Vital Kamerhe, and the president of the provisional office of the Senate, Mbueshi Kuongu Mwende. Ms. Arbour will equally meet with several ministers among whom those of Human Rights, Foreign Affairs, National Defense and Justice. The High Commissioner will also stop over in Kisingani (Orientale Province), in Bunia (Ituri district) and in Goma (North Kivu Province) where she will have discussions with the civilian and military justice authorities as well as with the national and international NGOs. Louise Arbour, from Canada, has a long professional experience in human rights field as well as in the academic field where she has received honorary doctorates from 30 universities and has published extensively on criminal law. The visit of the High Commissioner, the first to the DRC since her appointment as High Commissioner on July 2004, is part of a sub-regional visit that will also include Burundi and end in Rwanda on 25 May.